A seasonal show of 526 head saw a great jump in prices for fat hoggets selling to a top price of £114. Fat ewes sold to £102. P J Dougan, Coleraine, 29kgs, £114. Jas McCaughan, Armoy, 28kgs, £110. W Murdock, 27kgs, £110. D McCouaig, Ballyvoy, 27kgs, £109.50. Sam Gardiner, Stranocum, 26kgs, £109. S Heffron, Randalstown, 25kgs, £108.50. Jas Newell, Ballymoney, 26kgs, £107.50. K Lavery, Randalstown, 24kgs, £106.00. S McKinley, Portrush, 29kgs, £108. S Huey, Armoy, 25kgs, £1,07. 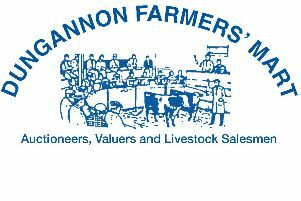 G Millen, Ballymoney, 24kgs, £103.50. S Heffron, Randalstown, 24kgs, £106. David McAllister, Bushmills, 22kgs, £97.00. M L Patton, Ballymoney, 22kgs, £100. J J McDonnell, Cushendall, 22kgs, £96.50. Alex McAllister, Armoy, crossbreds £102. S McGinn, Ballycastle, Texels, £88.00. R Taggart, Bushmills, Dorsets, £90.00. J Todd, Ballycastle, crossbreds £88.00. N Creith, Ballymoney, Texels, £92.00. J McLaughlin, Bushmills, crossbreds £88.00. J McAuley, Cushendall, crossbreds £79.00. Jas Reilly, Ballycastle, crossbreds £79.00. K Kane, Ballyvoy, crossbreds £77.00. Breeding sheep sold to £168.00.